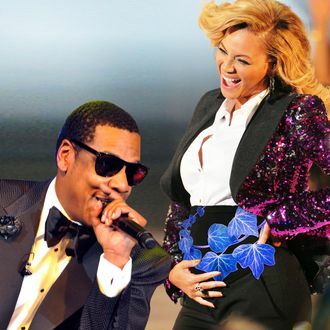 Vulture was confident enough in Babyoncé’s future music-making abilities to go ahead and write her first single, but even we did not predict that Beyoncé and Jay-Z’s child would be tearing up the charts at a week old. Thanks to dad’s adorable “Glory Feat. B.I.C.,” Blue Ivy Carter has become the youngest person ever to appear on a Billboard chart (“Glory” debuted on the Rap/Hip-Hop list at No. 74 this week). Congrats, Blue 4! Now feel free to send us Baby’s First Music Video whenever you’ve got those hand-wiggling moves down.